Again, there are many examples on the web which make you to follow a lot of indices and nested loops which makes insertion sort look difficult. The intent of this post is to help you understand the concept behind insertion sort and code in few minutes. The key to understand insertion sort is to first write a simple function that would insert an element into a given array that is already sorted. There are a couple of assumptions we are going to make here, to make the job easy. The elements in the array are already sorted, so we need to insert the new element in the right place or index of the array. Pick the last element in the array i.e the element before the empty slot. Compare the above array element with the new element we want to insert. If the array element is larger than the new element - We move the array element to a higher memory address or array index. We repeat the above process till we hit a condition where the new element is larger than array element. In this case we insert the new element in the current index/free slot of the array. Step 1 : Free slot is at the end of the array, we pick the last but one element in the array which is 10, since 10 is larger than 4, we move 10 to next higher index, now free slot is one level below the last element. Step 2 : Now we pick the next element which is 7, since 7 is larger than 4, we move 7 to next higher index, now free slot is two levels below the last element. Step 3 : Now we pick the next element which is 6, since 6 is larger than 4, we move 6 to next higher index, now free slot is three levels below the last element. Step 4 : Now we pick the next element which is 3, since 3 is less than 4, we insert 4 in the current index. Here is a simple code to do it. 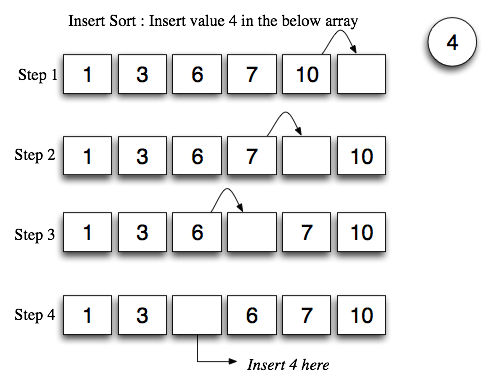 Now that we have understood the insert routine/method, lets look at insertion sort algorithm itself. Then remove one element at a time from the unsorted array, and insert it into the correct position in the sorted array. To find the correct position for the element, we use the above sample code. 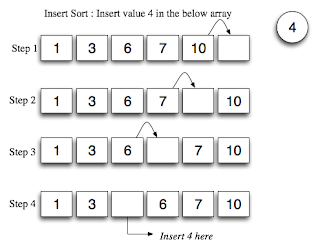 Now lets try to code implement insertion sort algorithm in the simplest possible way as explained above. Done, that's it. All we are doing in the above code is take/read each element in the unsorted array and inserting that element back into the array which does the sort. As you can see the algorithm can be implemented in few lines, easy to remember once you know how to implement insert routine. Here is the the insert routine/method, same code as above sampleInsert() - The difference is, rather than taking a value to insert, it takes the index of value to insert. What is the complexity of the above algorithm ? Its O(n2) - Since there is a nested loop. There is loop in the above sort() method, which calls insert(), which again has a loop. Hence a nested loop. Now lets consider the best case. What if the array is already sorted and we do a insertion sort on this ?. This means we need to insert element only at the end of the array. So the inner for loop never gets executed. So best case is O(n). Space Complexity is none since we did not allot any new arrays. Check the other article on How to find the complexity of a code and rest of the articles here. Here is the complete insertion sort sample java file used in this post.